So far, so good. We'll see what it ends up being when dry. 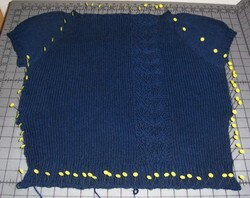 If it is still shorter than I would like, then I'll just rip out the bottom ribbing and add a few more rows. But I'm keeping my fingers crossed that I won't have to! I want a more "fitted t-shirt" look, and thus far it is looking like it is going to work (I decided to spare you the actual try-on picture, that is just not attractive!). I think that I will be able to get a much better reading once I pass the bust portion of the pattern. I'm keeping my fingers crossed.